Dolley Payne Todd Madison (1768 - 1849) was the wife of James Madison, and was "First Lady" of the United States from 1809 to 1817. Dolley was born and raised a member of the Society of Friends. On January 7, 1790, in Philadelphia, she married her first husband, John Todd, Jr. The couple had two sons, John Payne (1792 - 1852) and William Temple (born/died in 1793). In the fall of 1793, when the yellow epidemic broke out in Philadelphia, her husband moved Dolley and their sons out of the city to safety, while he returned to attend to the sick including his parents. John Todd and his parents soon died, however. Their youngest son, William Temple Todd, also died in 1793 from yellow fever. Dolley and her other son, John Payne, were both also afflicted with yellow fever, but recovered. An attractive young widow, Dolley returned to her Philadelphia dwelling, where a mutual friend, Aaron Burr, introduced her to James Madison. The home of Dolley and John Todd stands on the corner of 4th and Walnut Streets in Philadelphia. It was built in 1775 and occupied by them from 1791 to 1793. It is currently owned by Independence National Historical Park, which displays it as furnished to the time of their occupancy. 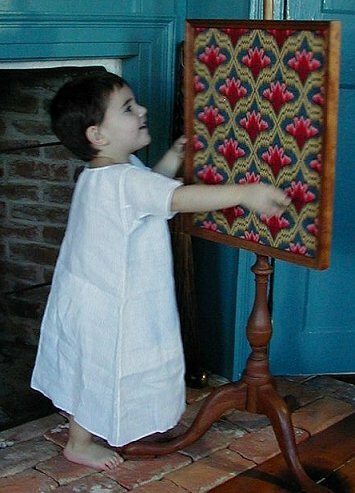 In the summer of 2008 I was commissioned by Independence Park to construct a full wardrobe for each of the two boys as they would have been dressed in early 1793, when John Payne was a toddler and William Temple a newborn infant. With the assistance of Elizabeth Bowling, whose skills at fine handsewing are astounding, I designed and created the following wardrobe. This gown is an exact copy of one worn by William W. Downing, born in Downingtown in 1791 (Chester County Historical Society 1990.1379, Fitting & Proper pp. 79-81), except it has been reduced to 95% of the size of the original, to fit a two year old. 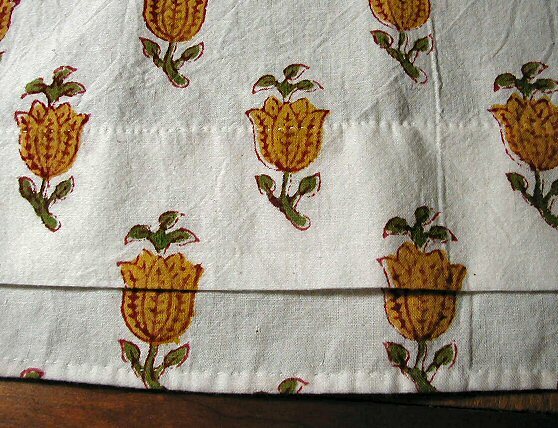 The fabric was obtained from Timeless Textiles (www.timelesstextiles.com ) and was selected because it had a similar weight and drape to the original, and is hand-printed in a similar floral spot motif. 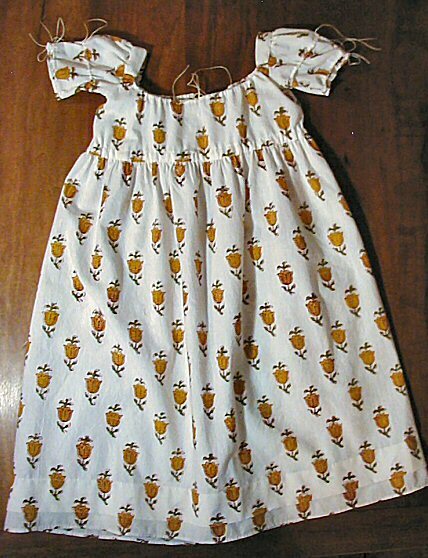 Although the floral motif on the replica fabric is a bit larger than that on the original, it is not out of scale for a child's dress of c. 1793, and it is in a colorway which suits the late 18th century Philadelphia Quaker aesthetic. The replica dress is of imported hand block printed Indian cotton, completely handsewn by me with cotton thread. 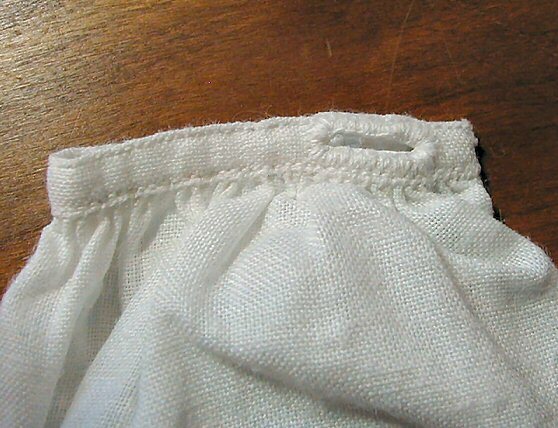 The drawstrings are linen cord. The petticoat is an exact copy of that worn by John Wilson c. 1772 (Chester County Historical Society 00/74 CLM1, Fitting & Proper pp. 82-83), except that the embroidery has been omitted. 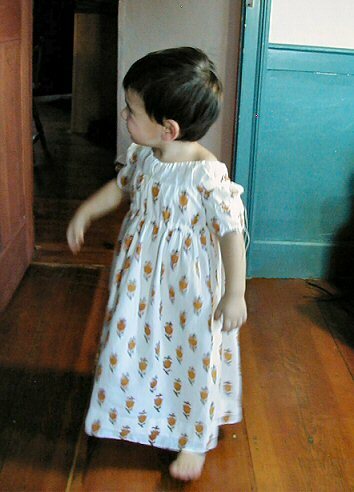 The original petticoat had a hem binding of pink worsted ferret, rendered here in worsted ferret dyed yellow with osage orange and black oak bark, to make a better match to the colorway of the gown. On the original, the waistband is missing; it has been conjecturally recreated in silk ribbon. 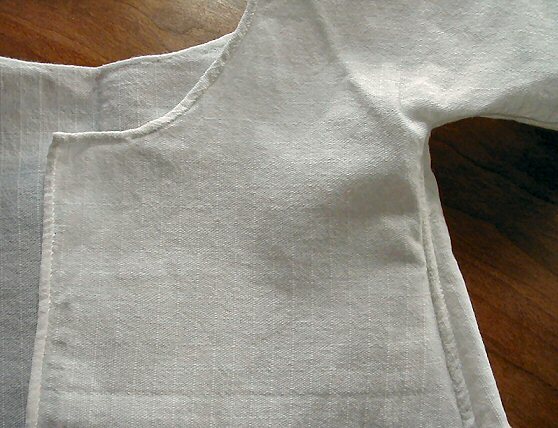 The fabric of the original, a creped worsted, could not be matched in modern fabric, so a lighter weight worsted was chosen as being suited to the more diaphanous clothing styles of the 1790's. The replica petticoat is fine worsted wool, with worsted ferret at the hem and silk ribbon at the waist, and is completely handsewn by me with silk thread. 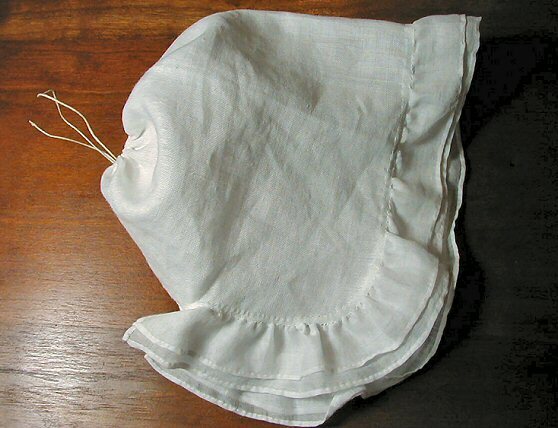 No extant 18th century American toddler shifts are known to exist. This shift is a toddler-sized copy of a woman's shift of c. 1793 (cf. e.g. 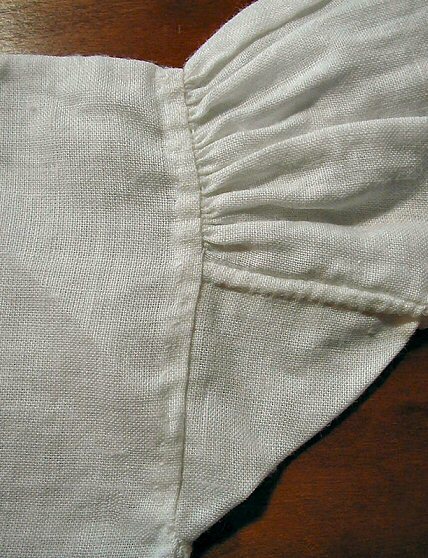 Chester County Historical Society 1990.991, Fitting & Proper pp.44-46), and is also based upon a make-do toddler's shift worn by Mary Compton in Middlesex Co. New Jersey c. 1810 (cf. What Clothes Reveal Fig. 270, p. 189). This replica is made of fine linen and is completely handsewn with cotton thread by Elizabeth Bowling. 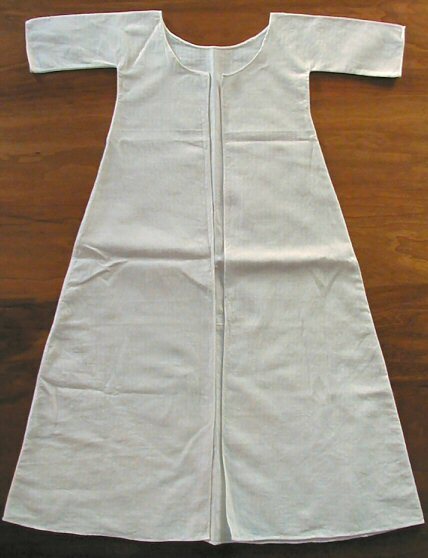 This gown is an exact copy of one in the collections of Historic New England (SPNEA 1923.0000), a white cotton dimity infant robe, worn in Massachusetts c. 1750-1800. The original had been subsequently modified to fit a toddler, but it is replicated here in its original configuration, for an infant. 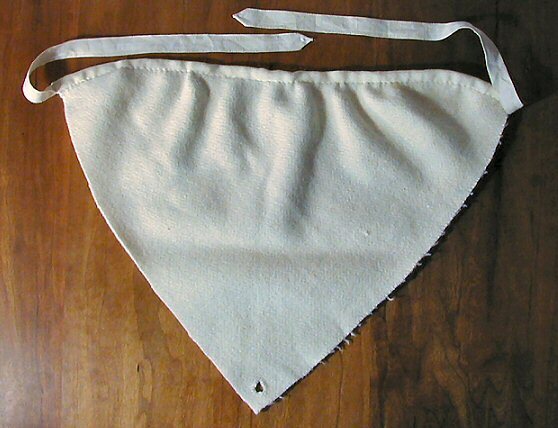 It is made of white cotton corded dimity, and is completely handsewn with cotton thread by Elizabeth Bowling. This shirt is an exact copy of one in the collections of the Chester County Historical Society (CCHS 1990.1315, F&P pp. 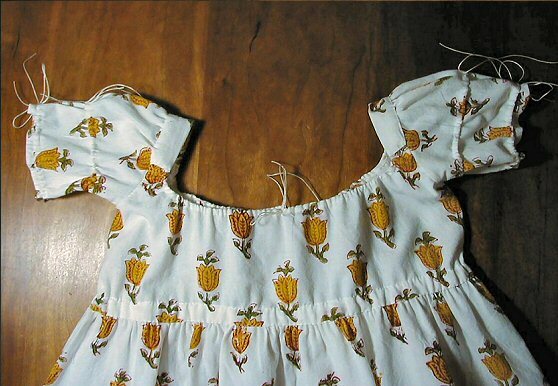 77-78), an infant shirt worn in Chester County c. 1750-1800. 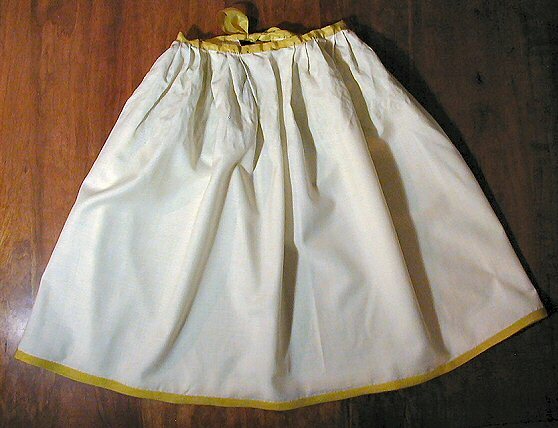 It is completely handsewn, and is made of fine linen with a frill of cotton mull. 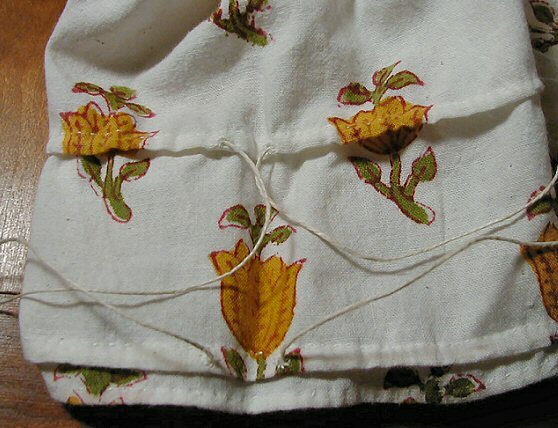 The cuffs are tied with narrow silk ribbon. It is completely handsewn by Elizabeth Bowling and is made of fine linen. 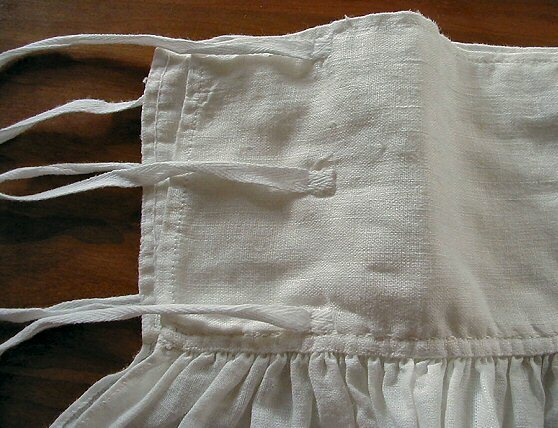 As with the napkin and pilch, there appear to be no known surviving 18th c. examples, so in lieu of an extant surviving example, this object is based upon a description from "The Nursery-Maid", in Hannah Glasse's The Servant's Directory, 1762 p.44: "a petticoat of fine flannel, two or three inches longer than the child's feet; with a dimity top (commonly called a boddice coat) to tye behind." 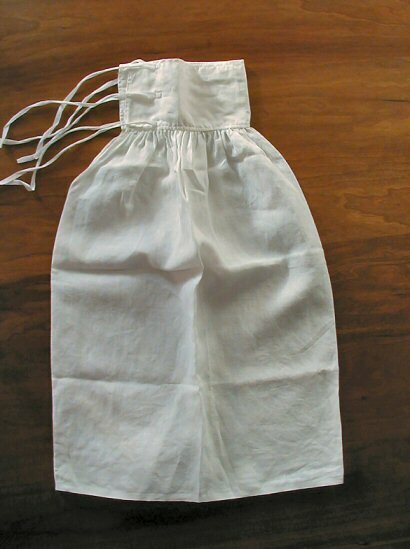 This infant petticoat has been made from fine white linen with a heavier linen "bodice coat" top, and has cotton tape ties. It is handsewn with cotton thread, made by Elizabeth Bowling. This cap is an exact copy of one worn by Lydia Howard Huntley Sigourney, born 1791 in Connecticut. (Connecticut Historical Society 1985.126.2). 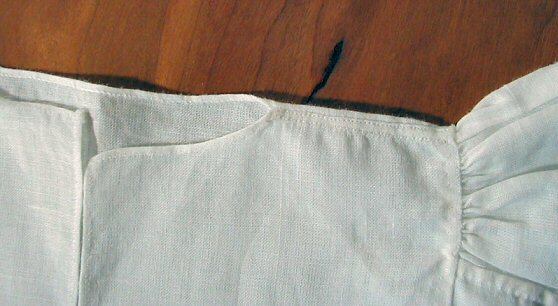 The drawstring is a heavy linen thread. 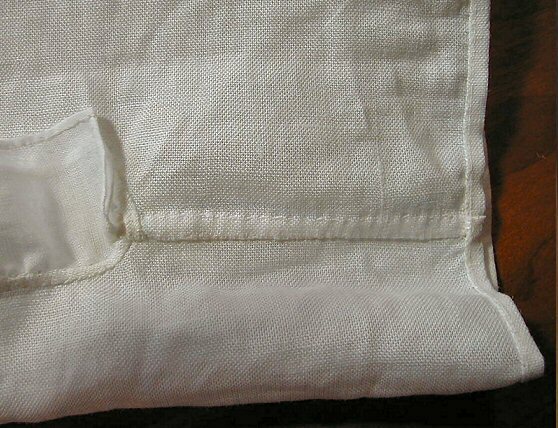 It is made of fine linen with a double frill of imported Indian cotton mull, and is completely handsewn by me with cotton thread. 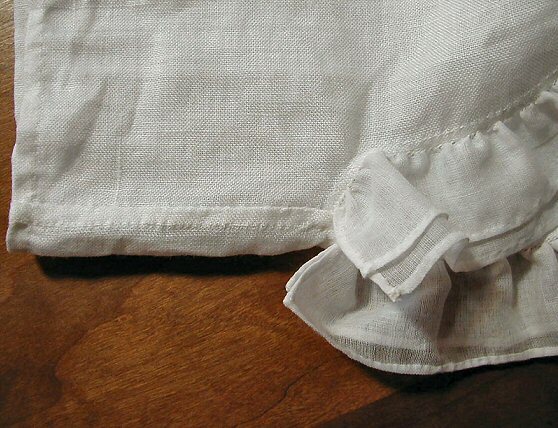 There are no known surviving 18th c. infant napkins to copy; it is most likely that they were recycled into rags, or that if any survived they could not be distinguished from other squares of cloth. Therefore the clout recreated here is speculative, based upon later sources, in particular The Workwoman’s Guide, by A Lady 1838, facsimile reprint by Dover, (p. 29 & pl. 3 fig. 11). In brief, it describes a double-thickness square of diaper weave cloth, with all raw edges enclosed, intended to be folded triangle-wise for use four thicknesses thick. 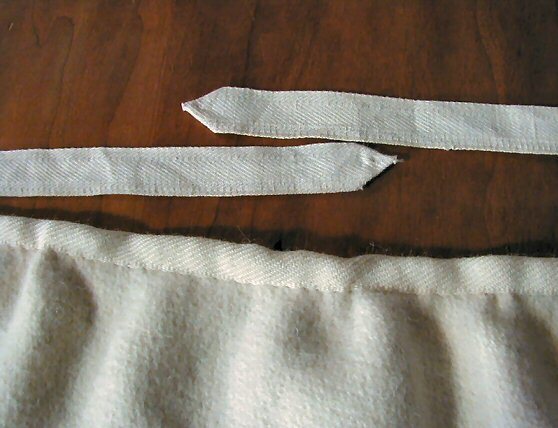 The author recommends sewing a tape-tie at the edge of each of two diagonally opposite corners, and a small tape loop at one other corner, so the "napkin" can be tied on the baby instead of using pins. 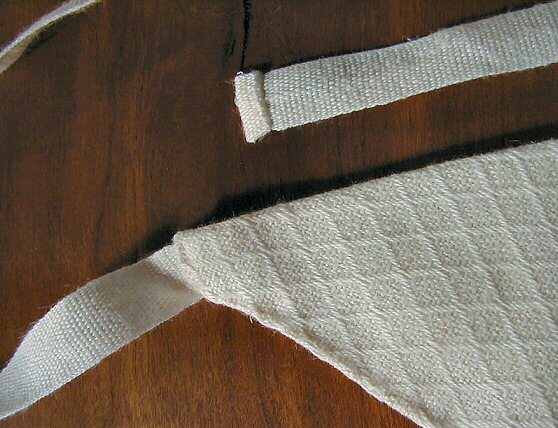 In replicating this object, the only suitable diaper-weave cloth which could be obtained was of too heavy a weave to make up into a clout which could be used successfully four thicknesses thick. The fabric was also too bulky to be hemmed neatly into a single-thickness square. 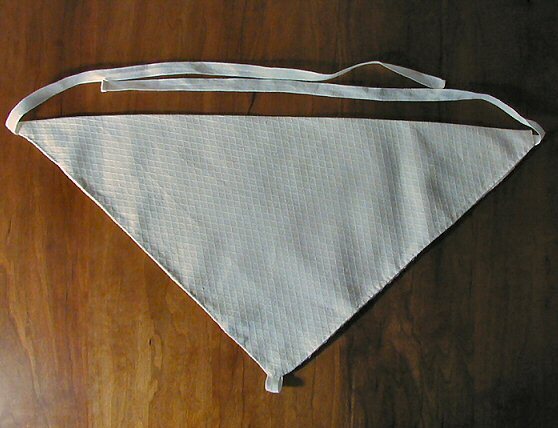 Therefore the clout has been created as a double thickness sewn triangle. 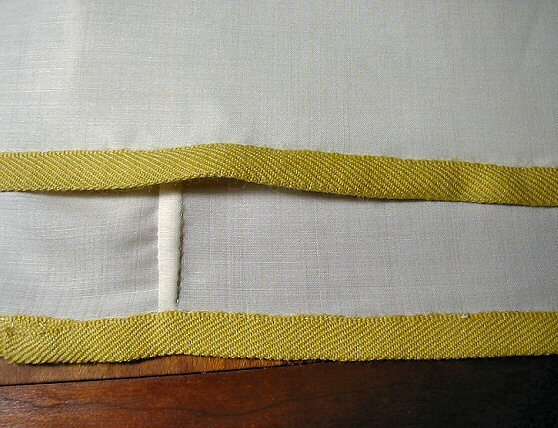 It is made of hemp/cotton diaper-weave cloth from www.wmboothdraper.com with linen tape ties, and is completely handsewn by me with linen thread. There are no surviving extant examples of an 18th c. pilch to copy, nor even any written descriptions of 18th c. pilches, merely inventory listings to document their existence. [cf. Buck Pp. 28 & 30]. The available evidence suggests that they were likely to have been simply wool triangles or squares, made of thin worsted fabric of a kind no longer being made. In order to utilize currently available fabrics, and to create a more structured and functional pilch, a pattern was adapted from The Workwoman's Guide, by A Lady 1838, reprinted by Dover, (p. 28 & plate 3 fig. 9, 10). 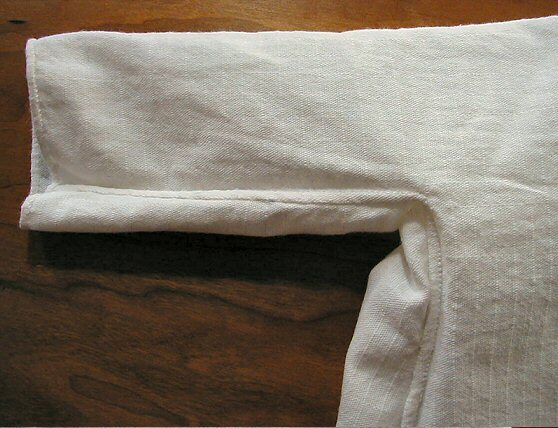 As recreated conjecturally, the pilch is a slightly contoured triangle of natural-white woolen blanketing fabric, with a worsted tape waistband and ties, and a buttonhole opposite, through which the ties can pass to secure the center-front of the pilch. It is handsewn by me with linen thread.